There is nothing better than finding a debut novel with strong recommendations from authors you dig and having the novel read like it was written by a seasoned pro. 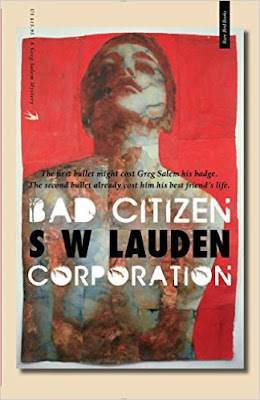 In other words, picking up Bad CitizenCorporation by S W Lauden is gonna make a lot of readers very happy. Lauden puts a nice twist on the standard PI novel. He has a surf-loving, punk rocking, cop on suspension main character as his PI. Greg Salem is suspended while he is being investigated for the shooting of a suspect who may or may not have been armed. Greg is sure the suspect was armed and he will be vindicated when the investigation is completed, but in the meanwhile he plans of playing some gigs with the band he left when he cleaned up from using drugs and became a cop over twenty years prior. Greg’s life gets even more topsy-turvy when the club his old band, Bad Citizen Corporation, is playing and—during their set—gets shot up and their drummer is killed. Is the shooting a random robbery or a more deviously plotted act? Greg decides to seek out the truth and he enlists the help of a drug addicted ex-bandmate, who always seems one step away from a total breakdown. Lauden handles this book with the steady hand you would expect from a more experienced author. The characters are engaging and unique, the plot is well-paced and unpredictable, and he keeps the reader invested throughout the book. The best part is the feeling the reader gets that PI Greg Salem just may turn into a recurring character if Lauden chooses to go the series route. This book has won over a lot of accomplished authors such as Joe Clifford, Rob Hart, Tom Pitts, and Eric Beetner and it is sure to get noticed by readers who like books that are original in characters and plotting. I for one am a fan of Lauden and will be eagerly awaiting his next book.